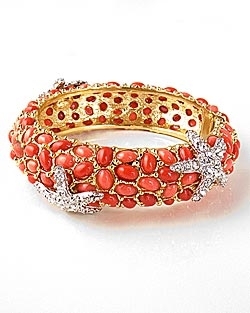 From the acclaimed designer Kenneth Jay Lane, a stunning gold cuff bracelet dressed with light and dark coral beads. Three sea stars covered with crystals adorn the gold bracelet. As seen on Elle Magazine.